Domestic terrorism has once again surfaced in the United States. This time, at a synagogue in Pittsburgh, Pennsylvania. Before you read the facts of this story, please remember this: Always know where there is the nearest exit, and always report if you see anything suspicious. Multiple people have been killed in Saturday morning’s shooting at the Tree of Life synagogue in Pittsburgh, according to a city official. The shooter surrendered to Pittsburgh police and was being transported to Mercy Hospital, said Curt Conrad, chief of staff for City Councilman Corey O’Connor. Another law enforcement official told CNN at least 12 people have been shot. Three police officers were shot, officials said earlier at an impromptu press conference. It’s unclear if they are part of those casualties. The shooter made anti-Jewish comments during the incident, a law enforcement official told CNN. Pittsburgh police Cmdr. Jason Lando previously said there were “multiple casualties.” Officers were dispatched to the scene after receiving reports of active gunfire at the synagogue, he said. 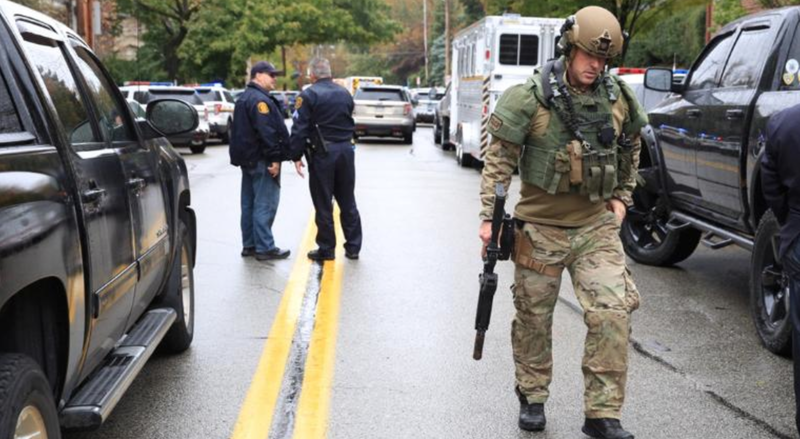 Fred Rabner, a member of the synagogue, said it was a “close-knit community,” and that everyone was calling around to make sure their loved ones are OK.
Pennsylvania Gov. Tom Wolf said on Twitter that it was a “serious situation,” and the Pennsylvania State Police were helping local first responders. Wolf is on the scene of the shooting, according to a tweet from his verified account. Special agents from the Bureau of Alcohol, Tobacco, Firearms and Explosives are responding to the shooting, according to the ATF’s Philadelphia field office. The Tree of Life synagogue is a Conservative Jewish congregation, according to its website. It’s in Squirrel Hill, a historic Jewish neighborhood. The synagogue has a Shabbat service at 9:45 a.m. Saturdays, the website said. Michael Eisenberg, the immediate past president of the Tree of Life congregation, said three congregations — Tree of Life, New Light and Dor Hadash — would have been holding simultaneous services in the building on a typical Saturday. There would usually would be about 40 people attending the Tree of Life service in the “main part of the building,” Eisenberg said. In the basement below, New Light’s service would also have about 30 to 40 people. And the Dor Hadash congregation in the rabbi’s study room would have about 15 people, he said. When he was the congregation’s president, security was a “major concern,” Eisenberg said. The congregation had worked with the Department of Homeland Security to evaluate its exit routes, he said, and consulted a securities expert at the Jewish Federation about what to do in an active shooter situation. “We were working with the other synagogues on what to do if something horrific like this happened,” he said. “This is what you dread hearing,” he said, adding he was concerned for those who might have arrived at the service on time, most of whom would have been older. CNN’s Keith Allen and Shimon Prokupecz contributed to this report. Israel Special Olympics Athletes Go For The Gold – 22 Times!